1 Department of Thoracic and Cardiovascular Surgery, The First Affiliated Hospital, College of Medicine, Zhejiang University, Hangzhou 310003, China. 2 School of Medical, Hangzhou Normal University, Hangzhou, 310036, China. Several studies revealed a similar down-regulation of telomeric repeat binding factor 1 (TRF1) in tumors. We have previously reported the TRFl expression levels were down-regulation in non-small cell lung cancer (NSCLC). The regulation of TRFl localization is proposed to be important for the function and expression. The nuclear localization signal (NLS) and nuclear export signal (NES) are often important clues to localization of protein. The objective of the present study was to investigate the NLS and NES of TRFl in NSCLC patients. Thirty (30) patients with NSCLCs had undergone radical operations in The First Affiliated Hospital, College of Medicine, Zhejiang University. DNA sequences of NLSs and NESs were amplified by PCR. The PCR products were analyzed by DNA sequencing. There were four NLSs of the TRFl protein, including two monopartite and two bipartite NLSs. The NLSs sequences were included in 337KKERRVGTPQSTKKKKESRR356. The exon 8 and exon 9 of TRFl DNA were covered the NLS sequences. The sequences of predicted NESs were 11WMLDFLCLSL86 and 174NLLKLQALAV183, respectively. 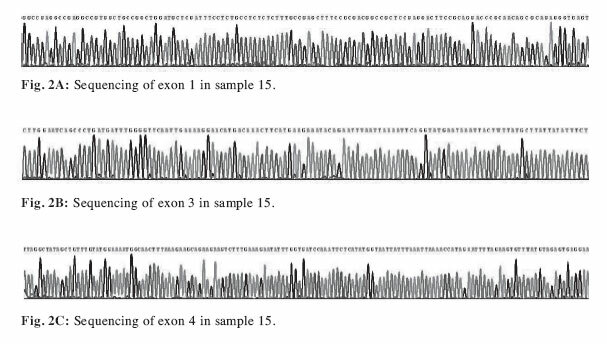 The exon 1, exon 3 and exon 4 of TRFl were covered the NES sequences. In NSCLCs, there was no a mutation, deletion, or substitution in NLS and NES of TRFl. We conclude that the NLS and NES sequences in NSCLCs patients did not have mutations. Down-expression of TRFl does not indicate gene mutation of NLS and NES in NSCLCs. Key terms: non-small cell lung cancer, telomeric repeat binding factor 1, nuclear of localization signal, nuclear of export signal, DNA sequencing. pivotal roles in telomere protection and maintenance in mammalian cells. In human cells, the TRF1 gene is located on chromosome 8ql3 and encodes a ubiquitously expressed protein of 439 amino acids. TRF1 is predominantly located at chromosome ends where they contribute to the protection and maintenance of telomeric DNA [Iwano et al., 2004]. Our previous studies have indicated that TRF1 was often present in reduced quantities in the cancerous tissues of NSCLC compared to its non-cancerous counterparts, suggesting that TRF1 expression is often disrupted during oncogenesis [Hu et al., 2005]. Recently, several studies also revealed a similar down-regulation of TRF1 in tumors [Yamada et al., 2002, Yamada et al., 2002, Miyachi et al., 2005, Lin et al., 2006]. These results suggest that down-regulation of TRFl may be a general phenomenon in cancer tissues. However, the mechanism of TRFl down expression is not very clear. Previous results showed that TRFl released from telomeres by tankyrase 1 [Seimiya, 2006]. Chang et al  indicated loss of TRFl from telomeres results in ubiquitination and degradation of TRFl by the proteasome and that degradation is required to keep TRFl off telomeres. Because the down-expression of TRFl could result from multiple factors, ubiquitination alone is not likely to be the only determinant of TRFldown-expression. When a mutation, deletion, or substitution occurs in the regulatory region of the TRFl, an altered expression is expected. TRFl expression may also be influenced by nuclear localization signal (NLS) and nuclear export signal (NES), or by other pathways. Protein import, in general, is specified by NLSs, which are most commonly composed of a short stretch of basic amino acids. The nuclear export signal (NES), a short leucine-rich motif, has been identified as a transport signal that is necessary and sufficient to mediate nuclear export of large proteins. In comparison to protein import, the molecular mechanisms underlying the active nuclear export of proteins are poorly understood. The purpose of this study is to test whether mutations exist in NLS and NES sequences. If there is mutation in the NLS or NES coding regions of the TRFl gene, it can lead to an abnormal protein structure and cause an altered function. In this regard, we established the optimal PCR conditions for amplification of the sequences of the TRFl NLS and NES. Detecting the TRFl gene of NLS and NES in NSCLC may present a clearer picture of deregulation of the TRFl in NSCLC. Thirty (30) patients with NSCLCs had undergone curative operations at The First Affiliated Hospital, College of Medicine, Zhejiang University. The diagnosis of lung cancer was obtained by histological examination in all cases. Tissue obtained at the time of surgery was confirmed by pathological examination. Tissue was frozen in liquid nitrogen within 30 min of removal and was then stored at -70° C until use. Paired noncancerous tissue was used as control. Approval from the Committee on Clinical Research of the hospital was obtained. Primer designed: NLS sequences correspond to residues 337 to 356 of TRFl. NLSs sequences are contained between the end of exon 8 and 9. Oligonucleotide primers based on NLS sequences were amplified both exon 8 and exon 9 of TRFl.The NES was 77WMLDFLCLSL&6 and \14NLIKIQAIAVn3 in TRFl protein, respectively. The sequences at the exon 1 and also requires sequences in the exon 3 and 4 region. Primers used in the study were designed with the Primer Premier 5.0 software. The primer sequences were summarized in Table 1. Genomics DNA was extracted from carcinoma tissues and paired noncancerous tissues using the DNA Tissue kit (Qiagen ,Germany). PCR amplification: In a total volume of 50[il, 100 ng of genomic DNA extracted from carcinoma tissues or paired noncancerous tissues was amplified in 5\ú lOxbuffer, ljxl dNTP(10mm/L) 1ml of each primer, 0.2ml Taq polymerase(5U/ul), 35 cycles of denaturation (at 94°C for 30 s), annealing (40 °C-60°C for 45s), and extension(at 72°Cfor 50s) were carried out in Techne Touchgene, USA. DNA purification and DNA sequencing: The product of PCR were purified and sequenced by Invitrogen (Shanghai, China). Sequencing was performed using the same primers as PCR amplification. Sequence chromatograms were analyzed with a chromas program. The sequence chromatograms are shown in Fig. The results show that there is no difference in the NLS and NES of TRFl between cancer tissues and paired noncancerous tissues. Compared to the sequence of TRFl in Genbank (NC_000008) and 10 non-neoplastic patients, no mutation was found in the NLS and NES of TRFl in 30 cases. TRFl is a mammalian telomeric protein that binds to the duplex array of TTAGGG repeats at chromosome ends [van Steensel and de Lange 1997]. We have previously reported the TRFl expression levels were down-regulation in NSCLC. We were interested in why most of the TRFl protein was often present in reduced quantities in the cancerous tissues of NSCLC compared to its noncancerous counterpart. The abnormal TRF1 expression could result from multiple factors including transcription processing, translation egulation and ubiquitination. TRF1 expression may also be influenced by NLS and NES, or by other pathways. The purpose of this study is to test whether NLS and NES play roles in regulation of TRF1 expression, so we observed the sequence of NLS and NES. The cellular localization of protein is closely linked to its NLS and NES [Nigg 1997,Gorlich and Kutay 1999]. NLS, which can direct protein through the nuclear pore complex are characteristically rich in the basic amino acids lysine and arginine. The cellular localization of a protein is indicative of its function. A NLS is a short stretch of amino acids that mediates the transport of nuclear proteins into the nucleus. Another typical NLS, known as bipartite NLS motif contains two interdependent positively charged clusters separated by a mutation tolerant linker region of 10-12 amino acids. Mutation in any basic amino acid cluster of this NLS sequence significantly affects its nuclear localization [Robbins et al.,1991]. Smith et al. study indicated that, synthesized TRFl, which contains two overlapping bipartite NLSs, could carry the tankyrase protein to telomeres. However, only transfected tankyrase is excluded from the nucleus. The demonstration that co-transfection of TRFl with tankyrase results in translocation of tankyrase to the nucleus, suggests the TRFl contains NLSs. In this regard, we used the method of DNA sequencing to examine the mutations of the NLS of TRFl. 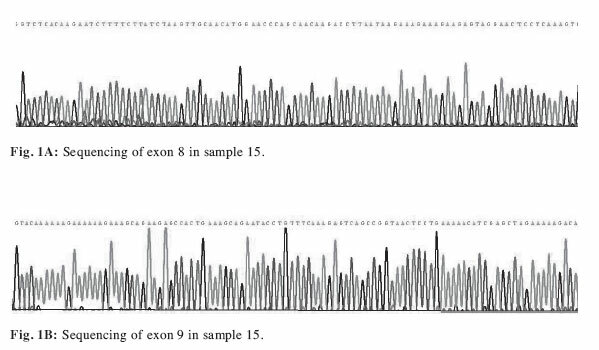 Because the NLS of the TRFl included only exon 8 and exon 9, these two exons DNA were sequenced in our study. However, base mutation was not found in the sequencing of the TRFl gene of exon 8 or exon 9. Thus we could not arrive to the conclusion that the mutation of NLS leads to the abnormal localization of TRFl. Nucleocytoplasmic redistribution of proteins involved in NLS and NES is evidently an important process in many systems [Heerklotz et al., 2001]. NES is a short amino acid sequence of 5-6 hydrophobic residues in a protein that targets it for export from the cell nucleus to the cytoplasm through the nuclear pore complex. It has the opposite effect of NES, which targets a protein located in the cytoplasm for import to the nucleus. The NES is recognized and bound by exportins. A mutation of NES residues prevented protein export. The balance of NLS and NES are decisive for the intracellular localization [Nguyen et al., 2002]. Bioinformatic prediction disclosed a putative NLS and a putative NES within human TRFl protein. The intracellular distribution of TRFl is evidently caused by the dynamic balance of nuclear import and export. Because the NLS of TRFl was not found to be mutant, in this study, we further examined the NES DNA fragments encompassing exon 1, exon 3 and exon 4, respectively. In NSCLCs, however, base mutation was not found in the sequencing of the TRFl gene of exon 1, exon 3 and exon 4. Thus we could not arrive to the conclusion the mutation of NES leads to the abnormal expression of TRFl. Savage et al  performed sequence analysis in five Osteosarcoma cell lines and targeted all exons and proximal promoter regions of TRFl, they did not identify mutations in the five Osteosarcoma cell lines studied. Although our study is small in size, it is sufficiently powered to identify common mutations. Our results suggest that there were not mutation, deletion, or substitution occuring in the NLS and NES of TRFl in NSCLCs. Down-expression of TRFl does not indicate gene mutation of NLS and NES in NSCLC. However, multiple mechanisms regulate subcellular localization of human protein: NLS, NES and phosphorylation. We further investigated additional studies to clarify this issue. In conclusion, DNA sequencing results showed that there was no base mutant, deletion, or substitution in NLS and NES of TRFl in NSCLCs. Down-expression of TRFl does not indicate gene mutation of NLS and NES in NSCLCs. The authors wish to thank all of the patients who so generously contributed their time to this important work. This work was supported by funds from Zhejiang Natural Science Foundation, Grant number Y206486.